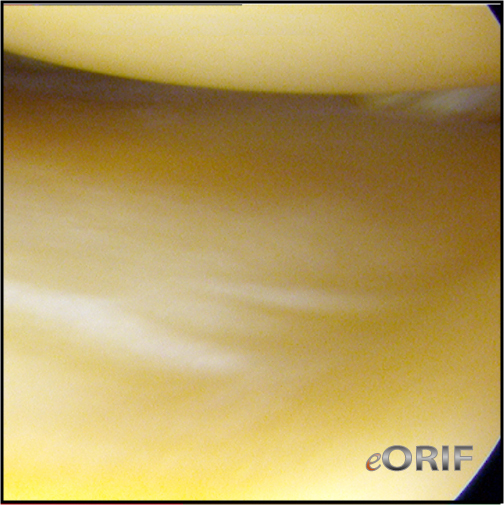 Radial tear with extention circumferentially creating a flap of meniscal tissue. Treatment = partial meniscectomy with preservation of normal meniscus. Generally unrepairable because the circumferential hoop fibers are disrupted and the majority of the tear is avascular. <3mm in depth do not require treatment. >3mm in depth = partial meniscectomy with preservation of normal meniscus. Ideal tear for repair is a longitudinal tear within the peripheral 3mm with a length of 1-2cm. Stable longitudinal tears <5mm in length and that displace <3mm do not require treatment. Generally repairable especially if associated with an ACL tear. Combination of other tears occuring in multiple planes. More common in older patients. Treatment: arthroscopic repair via bone tunnels. (Marzo JM, JAAOS 2009;17:276).